Elijah wasn't born a bibliovore, but he quickly became one after his first reading challenge. I remember reading the first chapter or two of The Boxcar Children to Elijah and conveniently leaving the book out for him to snag, if he wanted. I spied him peeking at the next chapter and remember him finishing off the entire read with speed that surpassed my own. That was his first chapter book. Shortly after the first taste of Boxcar, I gave Elijah his first reading challenge–to read through the nineteen original Boxcar Books. He was thrilled when he realized that these books already had a home on our shelves. He gobbled them. A few months later I challenged him to read 100 books. They could be picture books, chapter books, or anything between. I still have his list–written with wobbly handwriting. It's sweet to remember the little boy who accomplished such a big task. A year or so later, he was stuck on one genre–mystery. 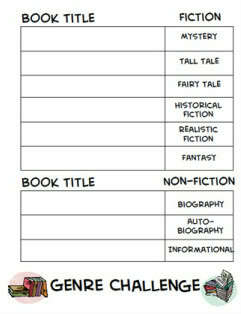 I decided to mix it up by presenting him with a challenge to read one book from each genre on the chart below. Fantasy became a new genre love. And now, four and a half years since that first challenge, I've presented him with yet another reading venture. I've asked him to read, record, and narrate 300 chapter books! He's excited. I'm excited for him. I would've eaten this alive when I was 10-years-old. I actually got in trouble in school for reading Just So Stories. My teacher couldn't afford to let me read when there were textbooks to scan and fill-in-the-blanks to be filled. Elijah knows of no such thing. He is free to read, and read he will. 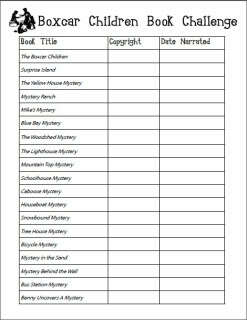 Maybe you can inspire your kids to read, too, by challenging them with these printable reading logs! Follow my Read! Board on Pinterest where I pin the best book lists and reading incentives I can find. Follow Homeschool Share's board Read! on Pinterest. This is such an awesome idea! Can I ask how old Elijah was when you started giving him reading challenges? I think this would be a great thing for Emily (she’s almost 6). Thanks for sharing this! Very frustrating to me, since I have always loved reading! Thanks! 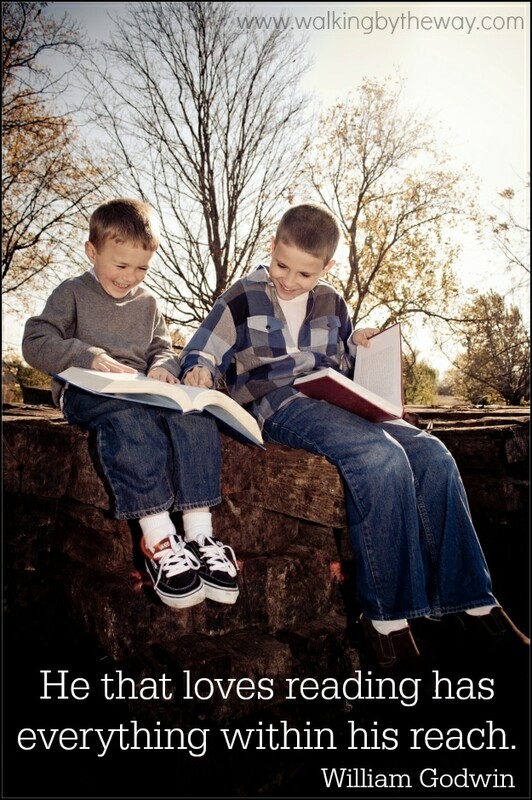 I have one reader(girl 9 1/2) that will read series books ONLY before bed and an almost 8 year old boy that is still struggling to learn to read, but I think he’d be all over this once he reads on his own. He loves to be read to. Thanks for the printables, Ami! 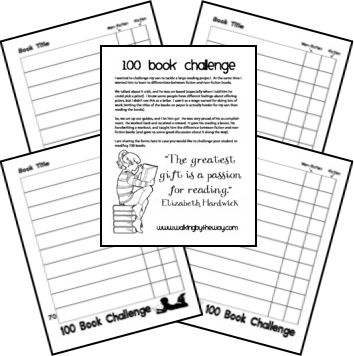 Hoping the 100 Challenge will inspire mine – particularly the ‘I CAN read very well but hate to’ child. Did you motivate your Son with a promised reward of any kind? 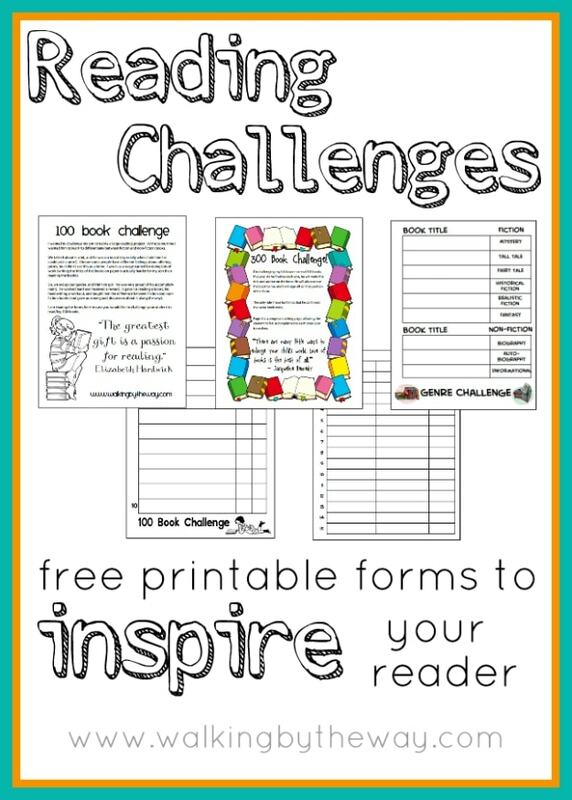 I love the idea of the reading challenge. This would make a great summer activity. I can’t believe I came upon this blog. The Boxcar Children are the first Chapter books I had ever read also. I never go anywhere without a book. When I was in my teens, I would bring a book into the movie theatre and read until the lights went out. However, when I bring up the Boxcar Children to my friends, they have never heard of it or the series. Those books are what turned me onto reading and my love of books. 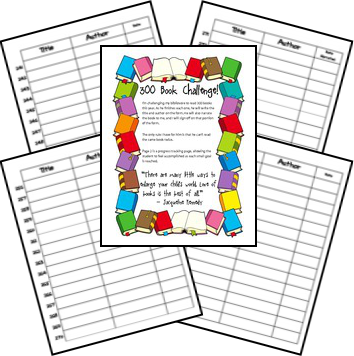 I love your idea of a reading challenge. I am going to start this tradition with my 5 year old. Thank you! What a wonderful idea. Welcome! I’m a big believer in inspiring kids, cultivating curiosity, delight directed learning, living books, field trip adventures, and keeping your sanity while homeschooling. I hope you find something encouraging here today! You can learn a bit more about me here.